This pepper sauce recipe is easy and so versatile. If you like hot spicy foods, you will love this! 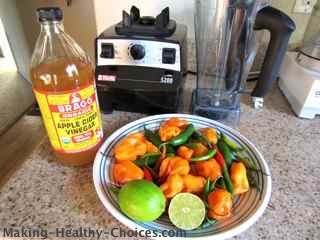 Along with the pepper sauce recipe, I have also included on this page a simple recipe to make hot chili oil. My family has consumed hot sauce for as long as I can remember... they put it on everything!! As a child and into my 20's I didn't like my food to be spicy but after living in the tropics in my 30's now my body can't get enough of it. My family smiles, as the little girl who once could not stand any spice now makes her own pepper sauce! There are many variations on pepper sauce recipes and the inspiration for the recipe below came from my cousin Illiana and has become a favorite in my home - thank you!! 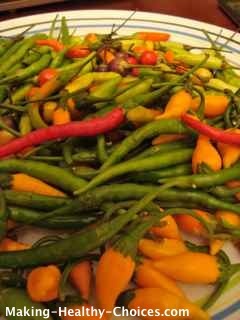 Chili peppers (also called chile or chilli) come in a wide variety of colors, shapes, sizes and heat intensity. 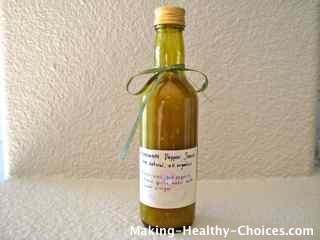 For this pepper sauce recipe, I use a variety of whichever ones are available at the farmers markets. You can mix and match whichever ones you like or you can use just one variety. Caution: After handling hot peppers, be sure to wash your hands well. It may be a good idea to use gloves, especially if you have sensitive skin. Very hot peppers can cause burns on the skin. As with all recipes use fresh organic ingredients and start every recipe with LOVE - it is the secret ingredient that will make your recipes shine!! See below for more information on some of the things mentioned in these recipes (other than chili peppers which are described above). Bring the water to a boil on the stove top. Quarter the lime and drop into boiling water (rind and all). Boil for about 30 seconds and then take off heat and set aside. De-stem the peppers and place in blender (I use a Vitamix Blender). Add into the blender the lime (that you had set aside), garlic and apple cider vinegar. Blend to the consistency that you like. Blending for longer will yield a smoother sauce while blending not quite as long will leave you with a pepper sauce that is a bit chunky. If more liquid is needed add a bit of the lime water that you set aside or more apple cider vinegar. Play with this pepper sauce recipe until you get a sauce that is the consistency and thickness you desire. Store in glass bottles or jars with air tight lids in the fridge. 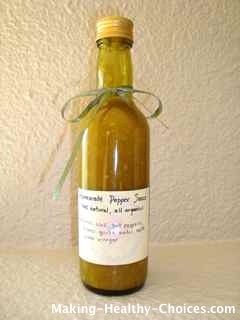 This pepper sauce will last a long time and is also great to give as a gift. Use this pepper sauce on just about any dish where you want to add a little heat. This makes a wonderfully spicy oil that can add that perfect heat to many dishes. 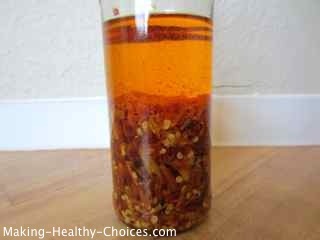 Simply fill any glass bottle with the dried chili peppers (I leave some whole but break apart most of them). Then fill the bottle to the top with olive oil, making sure to cover completely all the peppers. Let sit for 3 weeks (or longer), shaking every day. The oil will turn a beautiful color as it becomes infused with the goodness from the peppers. You can then transfer the strained oil into smaller glass bottles for use and re-fill the original bottle with olive oil again. Depending on the strength of the peppers you used you can get another batch of spicy oil a second and maybe even a third time. You can also leave the oil in the original bottle (with the the peppers) for use as this makes for a very decorative looking bottle of chili oil. 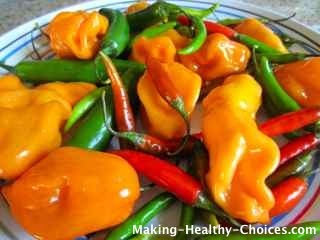 Between the pepper sauce recipe above and this hot chili oil recipe you now have two beautiful and very different vehicles to add a spicy kick to any dish you are making. Depending on the heat intensity of the peppers you used ... a little may go a long way so use caution when adding to your food and start with just a bit at first. Vitamix Blender is a very powerful high speed blender that is fantastic for making healthy raw food recipes. To learn more about and/or to purchase the Vitamix Blender, click here. Limes are wonderfully cleansing to the digestive tract, liver and gallbladder. 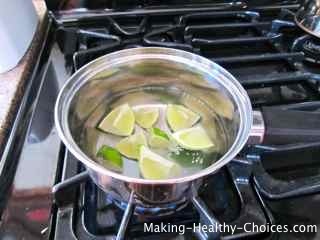 Limes are great in normalizing a queasy stomach and aiding in the digestive process. You can find limes in many markets and grocery stores. Apple Cider Vinegar in its raw form still contains much sediment (called the 'mother) in the bottle. It has a high mineral content which assists in normalizing the body's acid/alkaline balance and is also a great digestive tract cleaner and gall bladder/liver cleanser. Apple cider vinegar is known to help many conditions including removal of calcium deposits, chronic fatigue, headaches, food poisoning, high blood pressure and sore throats. Topically, apple cider vinegar is wonderful as a disinfectant and anti-fungal agent. Apple cider vinegar is widely available in most healthy grocery stores or to purchase apple cider vinegar online, click here.